For a while I wanted to write a little bit about this brand and one of my currently favourite lip balms. The brand itself comes from America and I have been a fan for a while now. Beauty gurus have been talking about it and word just spread. 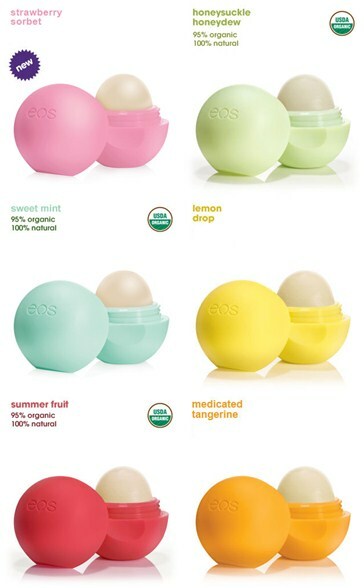 Evolution Of Smooth (or shortly EOS) earns its popularity in my opinion because of its natural ingredients and little sphere shaped lip balms. They have quite a nice range of products such as lip balms, hand and body lotion and shave creams. My personal favourites are lip balms. Some of them come in eye catching sphere shapes and delicious flavours such as Pomegranate Raspberry, Strawberry Sorbet, Honeysuckle Honeydew, Summer Fruits, Sweet Mint, Medicated Tangerine and Lemon Drop with SPF 15. My current favourite is refreshing Sweet Mint in a stick form. I do love the fact that it is 95% Organic, 100% Natural. Also, from the website (www.evolutionofsmooth.com) it claims to be Paraben, Petrolatum, Phathalate and Gluten Free, so no nasty ingredients, always great news. Sweet Mint is also rich in soothing Shea butter and vitamin E.
When you apply it on it gives your lips a little tingle, smells lovely and natural; even if I lick it, which I do try not to do ;) it tastes nice. It goes on smooth and clear and gives lips lovely moisture; ideal as a base for applying lipstick over. I am sure it is just a matter of time when EOS products become available in UK too. Until then shopping online for it will have to do.